Through a study abroad program, a recent Brooklyn College graduate channeled past adversities into helping the people on the island of Barbuda. 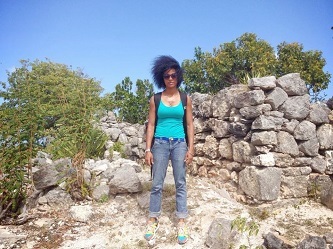 Jen-I Costosa '13 prepares to work at one of the sites of study in Barbuda. November is CUNY Month and International Education Month at Brooklyn College. This six-part series focuses on Brooklyn College's global engagement, from visiting professors, to international students and internships. Jen-I Costosa '13 is undaunted. A Brooklyn native and a graduate, with honors, from Brooklyn College's Children and Youth Studies Program, Costosa has overcome circumstances unimaginable to many. "My father died in 1989; my mom died in 1996. They both died of AIDS. So they were pretty much both gone before I graduated high school." Orphaned at 16, and receiving only tangential support from other family members, Costosa was determined to complete her studies at Brooklyn Technical High School, where she also played basketball, and eventually pursue a college education. She understood that she was part of a large population of young people, particularly those of color (Costosa's mother was African American and her father Filipino and Jewish), who lack community and institutional support, and often slip through the cracks. Following high school, she held a string of entry-level jobs to support herself until she found employment at Head Start. Head Start is a program that provides early educational opportunities to children from low-income families, a program that Costosa, herself, was enrolled in as a child. There, Costosa's academic promise was recognized, leading the program director to suggest that she enroll in college. It was not until she had made her way to Brooklyn College—a school she chose because she was impressed by the school's high standards for admission and its rigorous curriculum—that she found community and ongoing support. Her mentor, Assistant Professor Katherine Hejtmanek, from the Department of Anthropology and Archaeology, and the Children and Youth Studies Program, suggested that she take advantage of some of the opportunities the college offered. Costosa had never considered those possibilities. "Every time these opportunities came up, Professor Hejtmanek would say 'You should apply.' But I was working full-time and I didn't think I was that caliber of student. So I never even thought about it—not to mention trying to get time off of work to do these things." Costosa would later get the chance to pursue these opportunities. "The summer before senior year was a tough one. I had four deaths in my family back to back followed by losing my full-time job. So I then had the opportunity to apply for a study abroad program offered by the Office of International Education and Global Engagement." Another faculty member she came in contact with, Anthropology and Archaeology Professor Sophia Perdikaris, encouraged her to try a program on the Caribbean island of Barbuda, where students conduct research relating to environmental initiatives in the region. Costosa was awarded necessary funding for her trip by the Roy L. Furman '60 Furman Fellows Program. 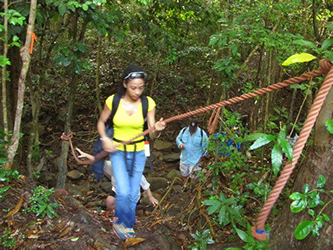 Jen-I Costosa '13 utilizes mountain climbing equipment during a hike to an archaeological dig in Barbuda. Costosa says the program gave her a certain flexibility and ability to acclimate to global cultures and engage in the kind of hands-on fieldwork that cannot be replicated in the classroom. She also formed a bond with Professor Perdikaris, for whom Costosa serves as acting research assistant for their work with the Barbuda Research Complex, the first nonprofit, conglomerate organization established in the region. "We built everything out of the Barbuda Archaeological Research Center (BARC). In January, we created the kids' museum. As others did with the adult museum, we built all of the exhibits and painted everything. Additionally, researchers are now growing plants, both medicinal and edible, and raising tilapia at another of the places we worked with, the aquaponics facility. [Distinguished Professor] Martin P. Schreibman ['56, founder and director emeritus of the Brooklyn College Aquatic Research and Environmental Assessment Center (AREAC)] set up the aquaponics there." Over the summer, Costosa worked at Children of Promise NYC, a camp program out of Bedford-Stuyvesant, Brooklyn, for children with incarcerated parents. In the spring, she will be working with Assistant Professor Rebecca Boger from the Department of Earth and Environmental Sciences under her grant to assist in the development of a related specialized course. Costosa is currently applying for the Master's of Arts in Liberal Studies program in Sustainability Science and Education at the CUNY Graduate Center. Once done with that, she plans to pursue a Ph.D. in anthropology, focusing on the effects of poverty on children. The experience in Barbuda has helped Costosa, who will be returning there next summer to continue her efforts, reaffirm her purpose. The island has a population of 1,800—50 percent of which is made up of children under the age of 18. Her interaction with them has helped her come to some profound conclusions about herself and her goals. "We're all connected. That cannot be denied. It's very important to reach back and help other people, especially the most vulnerable among us," she says. "And working with Professor Perdikaris has really helped to widen my scope in respect to that. I used to think about how vulnerable populations were challenged in strictly socioeconomic terms, but I wasn't thinking of it in terms of environment and climate change and how we could assist in making that less damaging."